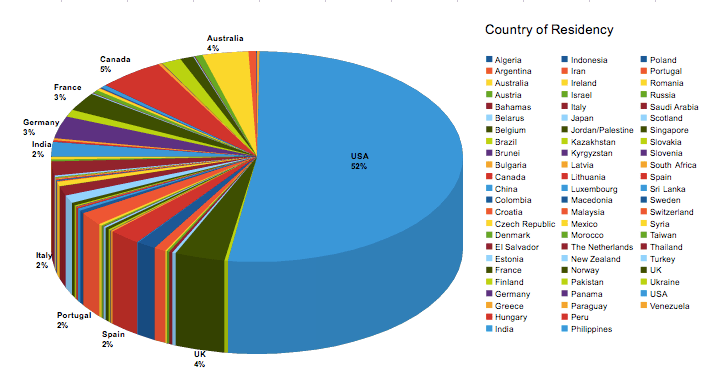 The open hardware community survey received 2091 responses from 70 countries! A big thank you to all those who took the time to fill out the questionnaire. We’re now sorting the data and will publish the aggregate results in the coming weeks. We hope that the information and insights you shared will help us better serve this community and make the case for open source hardware. And a special thanks also to those who provided feedback on the questionnaire itself. Your input is greatly appreciated and will help us do better next time. Initially we launched the survey with a question about race/ethnicity, but while this is a common demographics question in the USA, feedback from respondents in other countries informed us that this is not the case in several other regions. So, out of respect for different sensibilities, we pulled that question shortly after the survey launched and purged the data collected until then. You can download the feedback report here. Answered question: 1502 out of 2091. Breakdown by country: Algeria - 1, Argentina - 9, Australia - 54, Austria - 9, Bahamas - 1, Belarus - 1, Belgium - 16, Brazil - 23, Brunei - 1, Bulgaria - 4, Canada - 78, China - 7, Colombia - 2, Croatia - 1, Czech Republic - 5, Denmark - 7, El Salvador - 1, Estonia - 2, France - 43, Finland - 16, Germany - 51, Greece - 5, Hungary - 4, India - 32, Indonesia - 1, Iran - 1, Ireland - 6, Israel - 4, Italy - 32, Japan - 4, Jordan/Palestine - 1, Kazakhstan - 1, Kyrgyzstan - 1, Latvia - 2, Lithuania - 2, Luxembourg - 1, Macedonia - 1, Malaysia - 2, Mexico - 10, Morocco - 1, Netherlands - 21, New Zealand - 18, Norway - 7, Pakistan - 3, Panama - 1, Paraguay - 1, Peru - 3, Philippines - 5, Poland - 7, Portugal - 31, Romania - 4, Russia - 3, Saudi Arabia - 1, Scotland - 3, Singapore - 5, Slovakia - 3, Slovenia - 1, South Africa - 3, Spain - 37, Sri Lanka - 1, Sweden - 23, Switzerland - 14, Syria - 2, Taiwan - 3, Thailand - 4, Turkey - 4, UK - 59, Ukraine - 4, USA - 779, Venezuela - 3. ← Open Hardware in DC this Friday! The feedback report appears to have been exported by mistake as portrait orientation rather than landscape. Hi there. It’s a listing of comments, the portrait orientation is intentional. Ah, okay, I see what you mean. New version uploaded. Sorry about that! Nice work! 2091 responses from 70 countries! Indeed nice work! Looking forward for the result of this research! A minor comment: the channels you might have use to advertise the survey might have been a little biased concerning global coverage! Although I am sure there is a lot done in the OSHW realm in the US I think 52% is somewhat of an overestimate, don’t you think? 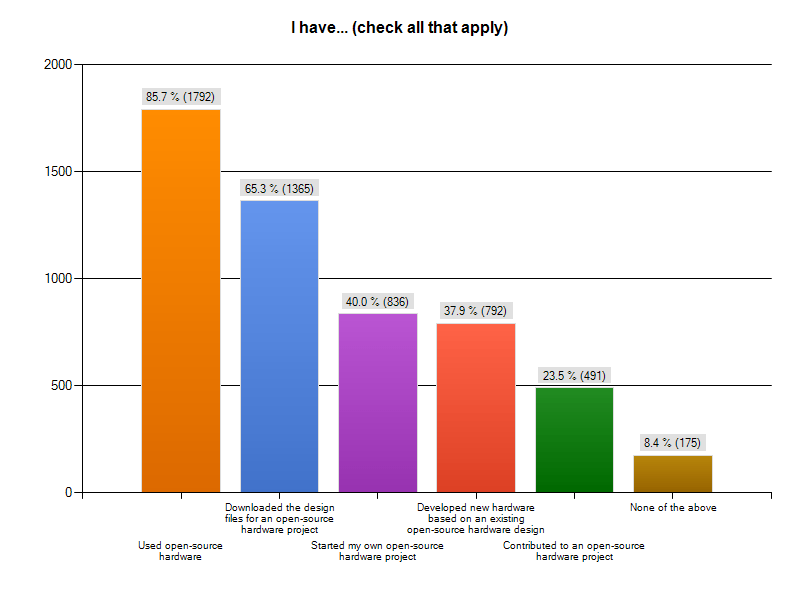 These numbers are definitely tied to the channels we used to advertise the survey – plus the fact that the questionnaire was in English – and don’t represent the actual percentage of each country’s contribution to the OSHW landscape. For example, I noticed that the number of responses was higher in countries where I specifically contacted developers and asked them to participate in the survey. Nevertheless, it’s great to see 70 countries represented and hopefully we’ll be able to reach more people next time. agreed! i would NEVER take 15 minutes to take a suvrey unless i was getting something out of it (i.e. have my name put in a raffle, coupon, etc.) which brings up an interesting point: if express were to offer me a coupon for taking a suvrey, i would totally do it.